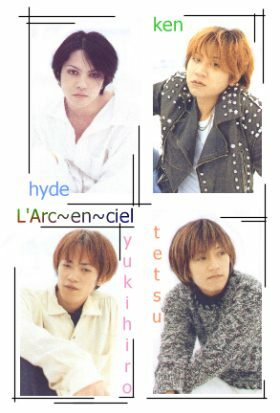 L'Arc~en~Ciel, "raindow" in French, was formed in 92.2 in Osaka by Tetsu. After the joining of drummer Sakura in 1/93, they became major. Their music, apart from the usual dark image of other Japanese visual bands, is very bright and elagant. In early 97, Sakura was accused of drug affairs and finally left the band. LARUKU ran silent for some time until Yukihiro, the new drummer joined in 97.6. Now LARUKU is one of the 2 hottest rock bands in Japan now (along with GLAY). Their songs vary a lot with mainly pop-rock songs, while Yukihiro the drummer brings many new elements into LARUKU with his DJing and remixing technique. LARUKU will release a live video "CLUB CIRCUIT 2000 REALIVE ~NO CUT~" on 6.20 (video:KSV5 5058, DVD:KSB5 5729)! This is a recording of their REAL tour on 00.10.27 in Osaka Zepp, including 14 songs and mc. hyde is marrying Ooishi Megumi! Congrats to them!